Some people are so devastated by illness that they become withdrawn and even bitter. 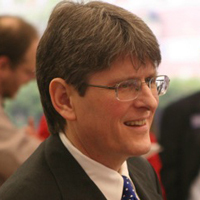 But for others, like Bob Massie, the challenge of physical ailments produces a ripening of compassion, a deep, first-hand awareness of suffering and of the need to be of service to others who suffer. Massie was born with hemophilia, a very painful disease that impairs the body’s ability to stop bleeding. A succession of blood transfusions also exposed him to HIV and hepatitis. Yet he managed to succeed academically (attending Yale Divinity School, becoming an Episcopal priest, and later earning a doctorate from Harvard Business School). In this episode, Massie tells the story of how his long battle with various illnesses sensitized him to human distress and deepened his commitment to helping people and protecting the environment we all depend upon. Physician Ralph Snyderman, who served as long-time dean of the Duke University medical school, believes that personal health (like our environment) should be regarded as “sustainable”, which means restructuring the roles of both doctor and patient.